Daily, we observe the need for good design, the design that extends to all industries and segments of society. There is one segment, however, that is left behind. This group may not realise, nor afford, the importance of design thinking. Underprivileged communities are overlooked by designers, in their quest to establish a career and profit. What designers forget is why they started their business at all; to create change, and impact society. And what better way to achieve this, than to look to those who deserve it most, and would benefit from the smallest design effort? A new logo, a revamped window, a carefully considered sign would not only introduce “good” design to a neighbourhood, it could solve problems, and positively affect the livelihood of a person. This Shukran means the world. The concept goes beyond charity and awareness-raising; it has developed to encompass an effort to bring good design and solutions to society, working with business owners and immersing oneself in the culture and daily life of local communities. These efforts are not without reward, new horizons open up opportunities, encouraging diverse clients and interesting projects. 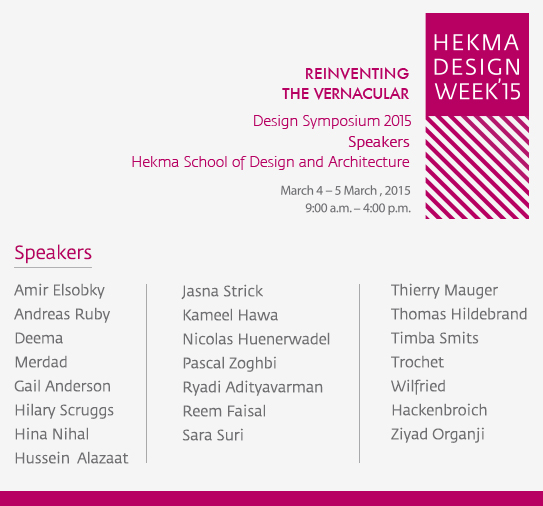 I’ve shared those commandments in my talk at Dar Al-Hekma University, in the Design Week 2015: REINVENTING THE VERNACULAR. 1. Know your skills playground! And find who might need it so you can serve and use best of your skills. Intervention is good. Don’t wait for their knock knock, they may be shy, or simply don’t know why you are needed! Good intentions create trust, remember this with your clients. 5. Design for what a human need.. or might need! You should know what are the needs, include them as a solutions in your offer. 6. Think, design, and apply! After spending your time in thinking, researching and design. Show the idea when it’s completed, stay away of half-road trip. Make real projects! 7. Stop be perfectionist for sometime! Perfecting every single damn detail before publishing your work is a very long and hectic process, train your self to take a break, and do quick stuff with 20% effort but that bring 80% of impact and benefits. Show your work confidently, and learn from your mistakes if happened. Other wise you remain in the shadow. 9. Make your clients famous! Helping people to be recognised would make you very recognised as well. Carry their story with you. 10. Take the shorter route to happiness! Money makes you happy, so why don’t you make it a step shorter and reach happiness directly without the money headache?